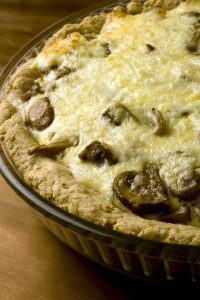 Low-Fat, High Protein Mushroom Quiche - A recipe from Savor California, the online showcase for extraordinary gourmet foods and beverages from California. This is a great recipe to make on the weekend and use the rest of the week for a high protein, low fat energizer to start your days. You won’t get hungry the rest of the morning when you eat this for breakfast. Perfect to take to work and reheat for a tasty lunch. You can make it ahead for overnight guests and have it all ready in the morning. Sauté mushrooms in 3 tablespoons olive oil. Add crushed cracker crumbs and press into well oiled quiche dish or round Pyrex pie pan. Sauté onions in remaining 2 tablespoons olive oil and sprinkle over crust. Add shredded cheese. The quiche will puff up beautifully and as it cools will settle back down. When you reheat it, the aroma and cheesy goodness will make you want more. It’s simply delicious, healthy, and so easy to prepare.